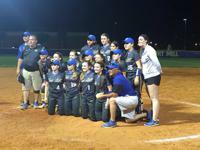 The FMHS Lady Jackets went 12-0 in region play to clinch the Region 3-AAAA Championship. In a game fore the ages, the Jackets beat last year's state champions, Clover, 3-2 in 10 innings to clinch the Championship and a first place seed in the upcoming district playoffs. Read the Herald article here. Keep up with the action and follow Yellow Jackets softball on Twitter: @FMHSSoftball.